Her name was Luce. She was born in 1909 in Montreal and died in 1989 in Vermont. Both of my maternal grandparents were French-Canadian and spoke a mixture of French and English. She had a hard life. Her mother died when she was 8 in the Influenza Epidemic of 1918. Her stepmother wasn’t a very nice woman apparently. She was one of 6 children and came of age during the Great Depression. She only attended school up to the 8th grade. I remember her always asking me a lot of questions about school and I think she wished that she could have gone to high school. My grandfather, her husband, was a difficult and selfish man. He was an alcoholic. He did stop drinking when he was in his 50’s so I think things got better after than. But she was fun and spirited. She loved to laugh. When she was 40 she decided she was sick of depending on my grandfather and went to driving school so she could learn how to drive a car. She loved to travel and would go to Florida to visit her brother. She started going by bus, then train and finally realized how much easier flying was. My grandfather wouldn’t go anywhere and never traveled by plane. One winter I went to Florida with her by bus. On the way back we got stuck in New York City during the blizzard of ’78. It was an adventure but it probably was dangerous for a 9 year old girl and a 70 year old woman from rural areas to be alone in New York. She loved playing games with us; card games and a game called Trouble. (I bought Trouble for my daughter recently out of nostalgia, I think, but she doesn’t seem that interested in it.) She would laugh and have so much fun but could also be very competitive. My oldest cousin started calling her Memere when he was little rather than grandmother (sort of like a contracted Ma Mere pronounced MemMay) and all of the rest of us grandchildren followed his lead. I remember being surprised when I got older that not all grandmothers were called Memere. I took this photo of her about 1.5 years before she died. I’ve always loved it. 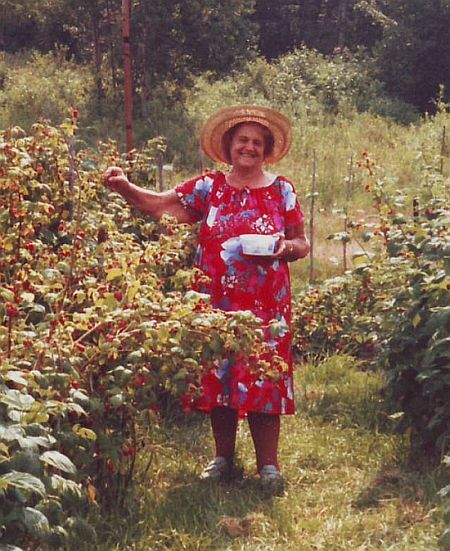 She’s picking her raspberries and the dress matches the berries. She also looks so happy. Before she passed away she was in the hospital for a week but never regained consciousness. I only went to the hospital once because I couldn’t bear to see her there. The one time I went I took her hand and she squeezed it. I didn’t attend her wake or her funeral either. Again, I couldn’t do it. Fortunately, my mother understood and didn’t force the issue. I don’t have much religious faith but I’ve always felt she was watching over me. At times when I’ve made stupid choices I’ve thought that I was disappointing her. If there is something more, then I hope my mother is with her now. My mother inherited her parents house and my brother’s and I just inherited it from my mother. It’s strange that I now own part of the house where my grandmother lived. A part of me thinks that I belong there. One of my long term goals is to go live there with my brothers although it isn’t something I can do right now. So, for this week of love, I though I would share a person that I loved very much. Plus, her birthday was also in February. Thank you for sharing your Grandmother with us. Her housedress in that picture reminds me so much of my Nonny! I hope you get to realize your long term goal of living in your family house with your brothers soon. That would be an awesome way for your daughter to grow up, I think. Hi Kim. Thank you for sharing Luce. What a lovely lady! I want to hug her. It was hard to read that part about you visiting her in the hospital that one time. That must have been a very difficult time for you — it made me tear up. I just love that photo of her. You’re right, she looks very happy — playful too. She comes alive in the photo. Life really is what you make it isn’t it? She had a hard life, but she didn’t seem to let it keep her spirits down. Thanks for the link share too BTW. What a beautiful tribute to your grandmother. She does look very happy in the photo. @Tracy – Thank you. It is a long term goal. I actually don’t think I can do it until my daughter is much older. Maybe I will retire there. It’s totally in the middle of nowhere – and it’s nice to be able to visit. @Jim – Thanks! I hope she would be. She wouldn’t be thrilled with the divorce but she would adore Alex. @Davina – Thanks for reading it. I was really hoping you would stop by since your article inspired me. There is something about certain grandmothers. My brother has a better copy of this photo so I’m going to grab it next time I visit him. Fortunately, he has no interest in photographs. @Vered – She was mostly happy. I have a lot of photos of her but this is by far the best one. I wish we still had the raspberry bushes but they are an incredible amount of work. Thank you for sharing your grandmother with me. Why don’t you believe she is watching over you, or standing next to you? That was beautiful. Thank you so much for sharing your grandmother with us. You definitely have her smile! This picture of your grand mother is very nice as it is shot at a natural pose. Looks like she was a very happy lady despite the hard phases of life you talked about. How often do we remember the difficulties that generations before us went through while busy cribbing about small small issues in the luxurious life these days? @Ari – I used to have a lot of faith and believed there was something after death. Now I’m not so sure. @Ajith – I think about that a lot. Whenever I complain about something stupid like the weather I think about how much I have compared to a lot of people in the world and compared to those who came before me. I try to stop myself from complaining unless it’s a serious problem. I’ve often thought that most of us have a unique and special bond with our grandmothers – I know I did. Sounds like you did too … and that bond still continues. @Ian – I think some grandmothers are more special than others. I did not have a close relationship with my Dad’s mother. She wasn’t very grandmotherly. But it’s wonderful to hear from other people who had close relationships with their grandmothers. Aww its really nostalgic to read something like that.. I don’t want my grandma to leave me either..
Kim – this is so beautiful. I really enjoyed reading your story about your grandmother. I find it really deepening to the spirit to experience a part of someone else’s story. I think many of us do have a special spot in our hearts for our grandmothers – I know I feel very nostalgic about mine too. And I totally understand why you wouldn’t partake in the funeral, etc. That is not how life is made stronger or better or we show more or less love. It is just society’s way of making drama where there need to be none. You now have the most beautiful memories of her and her spirit always with you and what more can a person ask for. @Evita – Thank you so much. I’ve never felt guilty about not attending her funeral but I think others might see it as disrespectful. It’s just not how I wanted to remember her. My brother went and he always told me that he wished he hadn’t. What a nice story. I didn’t know any of my grandparents. Barely heard of my aunts, uncles or cousins. As a child I didn’t realize how strange that was. All of my immediate family are very close. All the grandchildren know all of their cousins, aunts and uncles like family should. I think it depends on the family. I had all 4 until I was 18 but I didn’t know the ones on my Dad’s side until I was 11-12. His family wasn’t close but my Mom’s was. Thanks for the beautiful reminder about how it’s the people in your life who really count. Dad passed on Valentines a few years ago so this time of year is always a little tough. With that said, I always warm up when I think of him, and sometimes I would swear he is right here in the room with me as I write. Thank you. I’m sorry about your father – it’s hard losing someone on days that are celebrated. I just went through this and I can’t even imagine right now what next Christmas will be like. I was blessed as a child to have a wonderful grandma like yours. Mine was a very special lady. She entered my life as a substitute mom when I was 2 years old and got the whooping cough. To separate me from my baby brother so he wouldn’t get the whooping cough too, my grandmother took me to stay with her for awhile. Most of my most cherished memories of my childhood were times that I spent with my grandmother. Thanks for helping me to remember those times with your stories about your grandmother. Patricia – Spiritual Journey Of A Lightworker´s last blog post – Kindness—Why Is It Easier To Be Kind To Strangers? Hi Patricia – It sounds like you really bonded with your grandmother at that time. Apparently my mother was very sick before and after my younger brother was born – he is only 1.5 years younger. My grandmother took care of me for quite some time. That may how the strong attachment started although I have no memory of that time. They were English of the very formal, reserved kind. My Father’s parents both died when he was very young. Hi Patricia – It sounds like your children taught your mother how to be a “grandmother” and it might not have been a role that originally suited her. It’s interesting how very different grandparents can be. Your reply just made this idea pop into my head – I think I taught my mum how to be the mother I needed, she mixed that with 30 years of teaching first grade and came up following my children’s lead on how to be a grandmother.